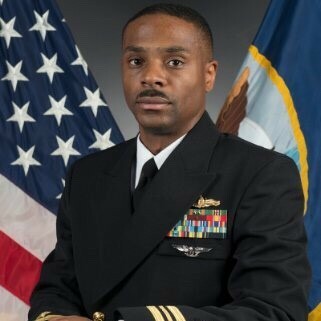 LCDR Desmond Walker is from Hollandale, Mississippi, and graduated from Norfolk State University in 2005 with a Bachelor of Science in Electronics Technology. He also earned a Master of Engineering Management from Old Dominion University in 2012 and Joint Professional Military Education Phase I from Naval War College in 2015 through off-duty educational opportunities. LCDR Walker currently serves on the personal staff of the Chief of Naval Operations (OPNAV N00Z) as his Navy Liaison Officer to the Commandant of the Marine Corps Strategic Initiatives Group, an active duty strategic think tank. Previously, he served on CNO’s staff as the Section/Acting Branch Head for Amphibious Warfare In-Service Readiness (OPNAV N95). Responsibilities included oversight of budget submissions, requirements development, and acquisition of ships in support of Expeditionary Warfare and USMC lift. A nuclear-trained Surface Warfare Officer, LCDR Walker served on 3 CVNs, 1 LHD and 1 DDG and worked daily to advance the mission and spirit of Surface Warfare in the execution of his duties as a division officer and department head. His thoughts on the Surface Warfare Officer community have been published in Proceedings Today online magazine, the flagship publication of the U.S. Naval Institute. From 1999 to 2007, LCDR Walker worked directly with children from 7 to 17 as a Youth Leader at the Herald of His Coming Church of God in Christ in Norfolk, Va. Positions included Sunday school teacher, bible study teacher, community outreach organizer and leader, adjutant to the pastor, choir director and a minister on the clerical staff. In 2017, he received the National Naval Officers Association’s (NNOA) Capt. Sallee P. Kafer Mentoring Award for several years of mentoring high school and college students that have interests in serving in the military, along with midshipmen and junior officers currently serving across the Navy and Marine Corps. In 2018, he received NNOA’s Dorie Miller Award for mentorship and advocacy of African American Surface Nuclear Officers and sustained mentorship of Midshipmen at Norfolk State University’s NROTC.